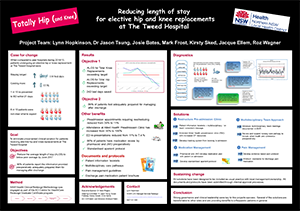 This project reviewed the journey of patients undergoing an elective total hip or knee replacement at the Tweed Hospital. In consultation with staff and patients, a range of improvements were implemented, including preoperative assessments, patient information brochures, clinical pathways and pain management. View a poster from the Centre for Healthcare Redesign graduation, April 2017. To reduce the Length of Stay (LoS) for patients undergoing elective hip and knee replacement, and better prepare patients to manage at home following discharge. Enhances collaboration between nursing, medical and allied health clinicians. Improves clinical pathways and protocols for medication and pain management. Streamlines the preoperative and post-operative patient journey. Better prepares patients for managing at home following discharge from hospital. Increases bed capacity in the hospital, allowing more patients to be treated. Decreases LoS and associated costs for the organisation. Reduces the number of patients presenting to the emergency department (ED) within 21 days of discharge. Reducing clinical variation is a key priority for Northern NSW Local Health District (NNSWLHD). A review of NSW health data for the 2014-15 financial year identified that average LoS and costs were higher for elective hip and knee replacements at the Tweed Hospital, compared to peer hospitals. This group of patients stayed in hospital a total of 110 days longer than peer hospitals and cost the organisation an additional $135,000. Further data analysis identified that 10% of patients were returning to the ED within 21 days of surgery and 60% patients did not know what to expect following discharge from their hip or knee replacement surgery. Following extensive consultation with staff and patients, the following four solutions were identified. A database was developed to track patients on their journey through the Preadmission Clinics, so all staff contributing to preoperative assessments could monitor their progress. The Allied Health Preadmission Clinic was expanded to allow individual assessments by both physiotherapists and occupational therapists, with a focus on preparing the patient for discharge. Patient information booklets will be developed and provided to the patient before they attend the Preadmission Clinics, to help them understand their journey through hospital and discharge instructions. Multidisciplinary meetings are held three days per week, comprising nursing, medical, physiotherapy, occupational therapy, pharmacy and social work staff. Following the meeting, the care plan is recorded directly into the patient’s electronic medical record. Clinical pathways were updated to reflect current best practice and expanded to include allied health disciplines. The expected date of discharge is displayed above the patient’s bed and reviewed by the ward physiotherapist, to help the patient prepare for discharge. Junior Medical Officers (JMOs) and pharmacists meet with patients on admission to discuss and order the patient’s usual medication before surgery. A ‘red flag’ medication list was developed to highlight which medications require consultation with registrars prior to ordering. An aperient medication protocol was established, to guide JMOs in the management and prevention of post-operative constipation. A pain management options paper was developed following a literature review, to provide general recommendations for JMOs on discharge pain management, as well as advice on what to include in the discharge summary for general practitioners. A discharge pain management brochure will be developed for patients. Implementation - the initiative is ready for implementation or is currently being implemented, piloted or tested. A full evaluation will be undertaken in April 2017, with a cost comparison undertaken in June 2017. 100% of patients felt that staff did everything they could to help manage their pain. The CHR framework is robust and provides a great structure to ensure timelines are met. Having the support of a key medical champion is imperative. The development of protocols and documents is very resource intensive and takes longer than anyone expects. Make friends early with executive assistants and receptionists – they will be your strongest allies. NSW Agency for Clinical Innovation (ACI) Musculoskeletal Network. NSW Evidence Review: Preoperative, Perioperative and Postoperative Care of Elective Primary Total Hip and Knee Replacements. Chatswood: ACI; 2012.